Mastering basic math skills is essential to solve many real world problems. Hence, once juniors are able to read on their own, they will also start seeing math word problems in their curriculum. These problems are designed to mimic real world problems and require juniors to create a mathematical model before they can solve the problems. Justin Holladay, a math teacher who has developed many math apps, recently released a story app filled with math word problems. The app is a combination of a math workbook and a storybook featuring Jack and the Beanstalk. You may have heard the story of Jack and the Beanstalk many times already: poor Jack was asked by his mom to sell their cow because they no longer had any money. On his way home from the market, he was stopped by an old woman who offered to sell him three magical beans. Not knowing any better, he decided to give away most of his money in exchange for the beans. 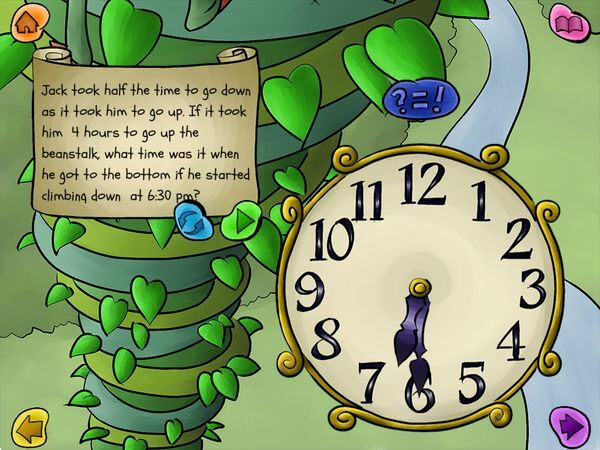 Now most book apps would typically move on to the next part of the story, but Jack and the Beanstalk - A Mathematical Adventure is no ordinary app. Here, the app starts showing a mathematical problem that the reader needs to solve before the story can continue. In the passage I mentioned above, readers need to help Jack count up the money he has using US currency, and then figure out the correct amount to pay the old woman. Jack knew he would need 75 beans. Each cluster has 5 beans. Put the correct number of clusters in the basket. Many of the problems require you to drag objects or move the hour/minute hand of an analog clock. Once you're ready with your answer, you can tap on the ?=! button to check whether you have the correct answer. The storyline in this app has been adapted to fit its mathematical adventure design. Needless to say this is not your typical book app. If you want your juniors to experience an innovative way to practice their math skills, this is definitely an app that I'd recommend checking out. A nice feature is that even though readers are provided with challenges to get the story moving, they can still skip a problem page altogether. They can also tap on a recycle button to try different set of values on the same word problem. When you revisit a problem page, the app randomly generates values for each variable, so readers have a slightly different problem each time. I like how the problems introduced in the app are creatively designed to fit the storyline and the characters. For example, the beanstalk is so high that it would take hours for Jake to climb it. The developer cleverly designed a time addition problem surrounding this fact, in which you need to identify when Jake would reach the top given his start time and estimated elapsed time. Another excellent problem is when Jack tries to slide down from the top of the beanstalk. We all know that sliding down should be much faster than climbing up. Again, the developer designed a time addition with a clause saying that Jake only needs half his climbing time to slide down the beanstalk. Two other problem designs that I like are the geometrical shape identification problem and the weighing scale problem. Both games are also nicely designed to fit the storyline, and offer variations to the algebra-related problems. The app includes various types of math problems. 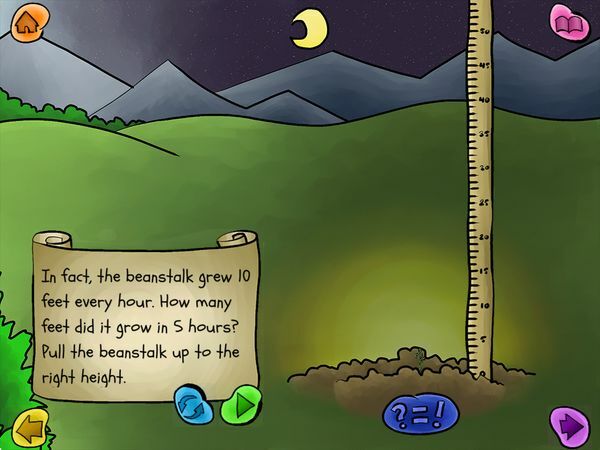 Jack and the Beanstalk - Mathematical Adventure is a math workbook app disguised in a storybook. If your juniors lack the motivation to practice their math skills using more conventional approaches, you might want to give this app a try. As long as your juniors are old enough to read on their own, they should be able to enjoy reading and playing in this app. Get Jack and the Beanstalk - Mathematical Adventure on the App Store.